What is St. Andrew’s cross? 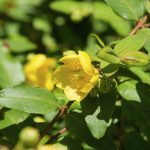 A member of the same plant family as St. John’s wort, St. Andrew’s cross (Hypericum hypericoides) is an upright perennial plant that grows in wooded areas in most states east of the Mississippi River. It is often found in swamps and wetlands. St. Andrew’s cross plant is named for the bright yellow, cross-shaped flowers that appear from early summer until autumn. This is a lovely choice for a semi-shady woodland garden. 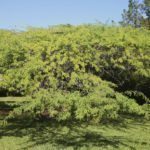 Growing St. Andrew’s cross in gardens isn’t difficult. Read on and learn how to grow St. Andrew’s cross wildflowers. St. Andrew’s cross wildflowers are suitable for growing in USDA plant hardiness zones 5 and above. Site the plant in partial sunlight and nearly any type of well-drained soil. St. Andrew’s cross plants can be propagated by seeds directly in the garden any time after danger of frost has passed. Alternatively, get a head start and plant them indoors a few weeks before the last expected frost. Be patient, as germination takes one to three months. In time, the plant spreads up to 3 feet (1 m.) to form a dense, flowering mat. Mature height is 24 to 36 inches (60-91 cm.). Water St. Andrew’s Cross regularly until new growth appears, indicating that the plant has rooted. Thereafter, St. Andrew’s cross plants require little supplemental irrigation. Control weeds by pulling or hoeing lightly until the plant is established. St. Andrew’s cross wildflowers generally require little fertilizer. If growth appears slow, feed the plants using a dilute solution of a general purpose, water-soluble fertilizer. 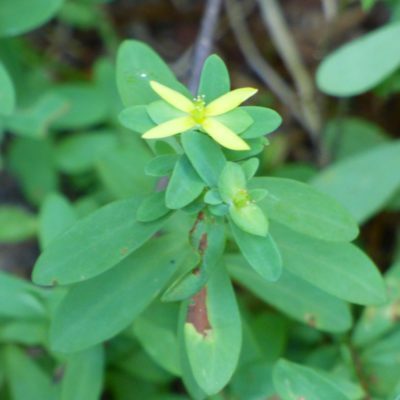 Read more articles about St. John's Wort.